I always kid Dennis that even if we ever become billionaires, I’d still be hunting for bargains. It drives him crazy whenever I shop around tirelessly before committing to a purchase. You have to make sure you get the best deal, I always tell him. Why get something at full price if you can get a jaw-dropping deal, right? I must admit, however, that on occasion I go overboard and feel compelled to buy something only because it’s on sale — even if I don’t have any use for it, which is outright ridiculous, I know. And there are times when I feel I ended up paying more because of all the time I exhausted shopping around. But last Saturday’s deal on red bell peppers at the Alemany Farmers’ Market was a bargain I simply could not pass. One dollar for a basket of gorgeous red bell peppers. Four big beauties in a basket. I thought about roasting and canning them, which would be fantastic hors d’oeuvres, but as I flipped through my Ad Hoc at Home I spotted something I have never made before. 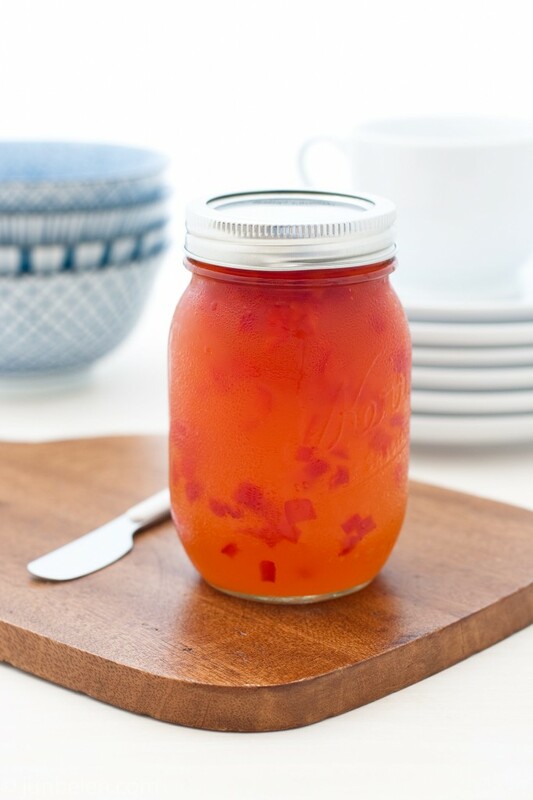 Red pepper jelly. When paired with a creamy and mild cheese like a Spanish capricho, the sweetness and tanginess of red pepper jelly truly shine. Plus the tiny, bright red bell pepper pieces give it a wonderful, sweet crunch. Cut enough red bell peppers into 1/4-inch dice to make 1 cup, reserve. Cut the remaining peppers into 1/2-inch pieces, place in a medium saucepan with the serrano pepper, vinegar, and salt, and bring to a simmer over medium heat. Cook, stirring occasionally, for 15 to 20 minutes, until the peppers are tender. Line a fine-mesh basket strainer with dampened cheesecloth and set it over a deep bowl. Strain the pepper mixture through the cheesecloth. Do not push on the solids (that would cloud the jelly). Twist the cheesecloth and let it sit in the strainer for about 15 minutes, lightly twisting and pressing gently from time to time to extract all of the liquid. You should have about 1-3/4 cups liquid. Discard the peppers. 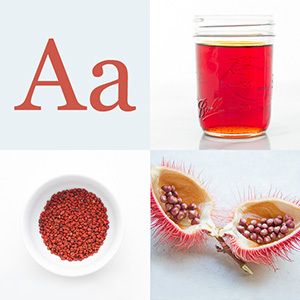 Combine the sugar and pectin in a small bowl, mixing well so that the pectin will dissolve smoothly. Heat the canola oil in a small frying pan over low heat. Add the diced peppers and cook slowly to soften them without coloring them, about 5 minutes. 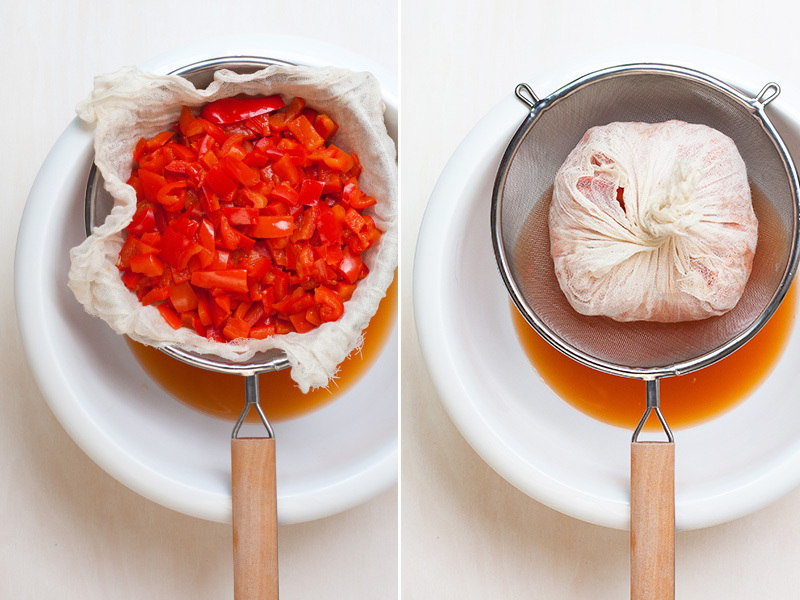 Drain the peppers on paper towels, then place them in a clean large saucepan. Add the pepper liquid, increase the heat to medium, and heat until the liquid is warm. Slowly add the pectin mixture, whisking until dissolved, then attach a candy thermometer to the pan. Increase the heat, bring to a simmer, and simmer until the jelly reaches 215 to 220 degrees F. Remove from the heat. To check that the jelly is at the right consistency, put a tablespoonful of what you’re cooking on a plate and chill it in the refrigerator for 10 minutes. If it is too thin, return to the heat, cook a few more minutes, and retest. Pour the jelly into a canning jar or other storage container, cover, and let cool to room temperature, then refrigerate for up to a month. 1. Thomas Keller lists the California Institute of America at Greystone as his source for apple pectin. I used regular pectin to make my jelly and it worked fine. Whole Foods has Pomona’s Universal Pectin in 1-ounce packets in pastel blue boxes. 2. I used 5 red bell peppers with a total weight of 30 ounces and made roughly 2 cups of jelly (2 cups of pepper liquid). The small 2-cup canning jars work very well for this recipe. 3. I used one serrano pepper, which I seeded as instructed in the recipe. I didn’t think it gave the jelly extra heat. I would suggest adding some serrano seeds to kick the heat up a notch. 4. Red pepper jelly goes very well with a creamy, mild cheese like capricho. 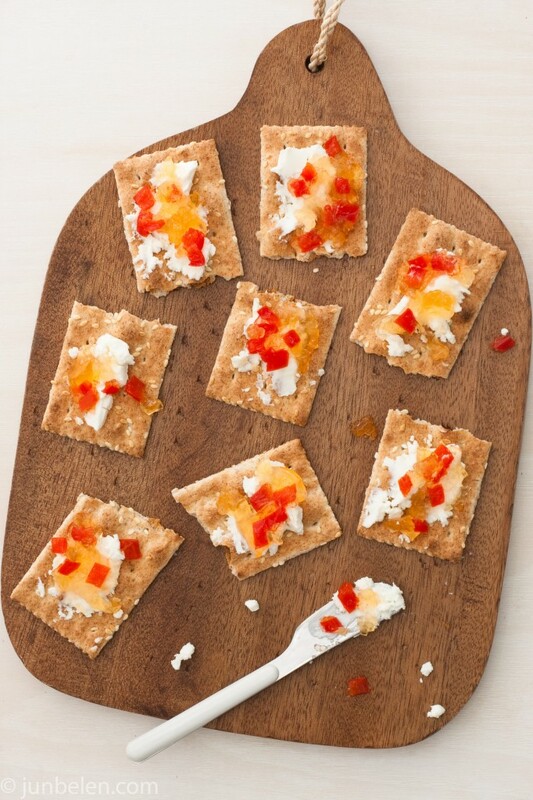 Spread it on crackers for a little more sophisticated snack or appetizer. For breakfast, spread red pepper jelly and butter on a toasted muffin and it’s simply delicious. i love red pepper jelly! i have one right now which i got from the local farmer’s market. it’s stonewall kitchen brand but too sweet for me. i prefer the homemade red pepper jelly my friend gave me sometime ago. oh, i also looove bargains. i always carry my purse bec you’ll never know when those manufacturers/store coupons would come handy. That’s why you were looking for apple pectin! OK, I have a plan: get these poblanos and bells hinog, and I’ll try your recipe. I was so ready to make everything achara, LOL. Thanks, Jun. Another winner! Dina, try this one out. It’s absolutely foolproof. And it’s not at all sweet, a bit tangy, which is why I love homemade red pepper jelly! Yes, Annapet, that was why I was looking for apple pectin. The regular pectin worked out fine. Poblano pepper jelly… that sounds like a winner to me! Try it out!! this is something my mom would love. i cant wait to make it with her. thank you for this post! your site is so pretty! This brings back memories of my mom’s canning and jelly phase. I’ve always been a savory kind of gal so I really loved her pepper jelly. i never realized that that bell peppers can be used in a jelly. i might have to try this soon. does it taste like pimento? This looks amazing, your photos are surreal! Pepper jelly is truly a good appetizer for every dish. I’ve seen a lot of recipe in the web but this one is different. I can’t wait to try it. The picture with the crackers is fantastic. We love pepper jelly. This is so delicious. I have found the red pepper jelly in country stores and use it on wheat thins with a little cream cheese. This is such a tasty snack. It is also addicting and you cant eat just one!